As we wrote a number of times, the multiannual budget of the European Union was always a reason for many disputes and quarrels, but the discussion of the framework for 2014-2020 is different, because it is taking place in a dynamically changing environment as a consequence of the unfolding debt crisis in the eurozone. The beginning of the discussions was given in the summer after the European Commission presented its proposal about how the financial framework of the EU should look like for the next 7 years. 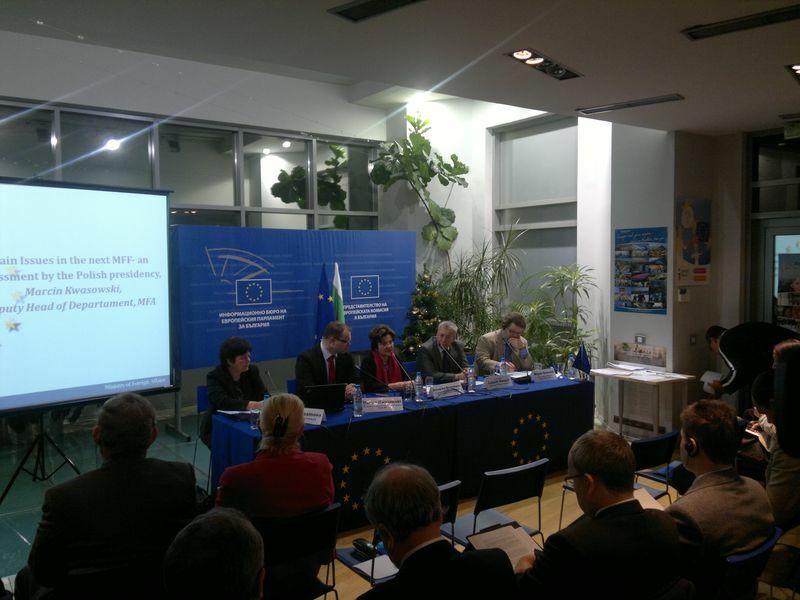 The Polish Presidency took over by organising a series of discussions in various formats. At the current stage the debates are on the proposal itself. The real negotiations are expected to start after New Year. During one of the big debates in the EU in October, the EU leaders made it clear that, no matter the goals and good intentions, this budget was a victim of the crisis and in the current conditions it could not be changed. This is why the Commission's proposal is an attempt for a balance between austerity in the member states and investment in community policies, accompanied by reforms of some of the oldest policies like the Common Agricultural Policy and the Cohesion Policy. Indeed Poland's efforts deserve praise (the country's presidency expires on December 31), because the country continued the deliberations in spite of the turbulences. Moreover, Poland organised discussions on national level too. 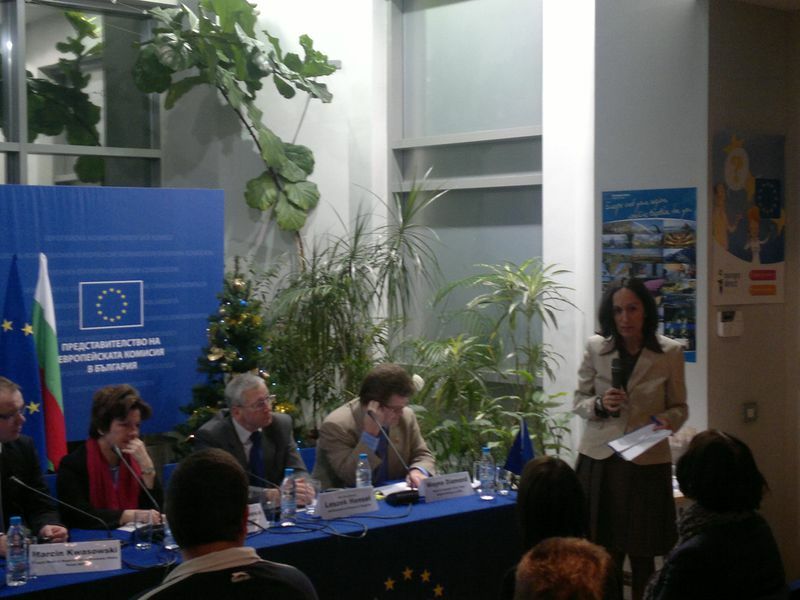 Such a discussion took place on November 30 in Sofia, organised with the support of the European Commission Representation in Bulgaria. euinside also took part as a moderator in one of the panels. 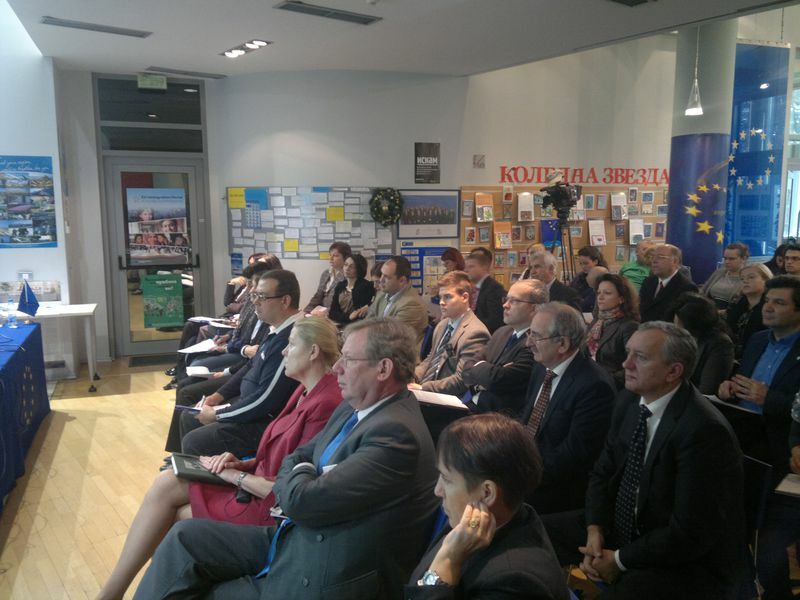 Representatives of the Bulgarian Ministry of Foreign Affairs, of the Finance, representatives of the British Embassy in Sofia, of the Warsaw University, of Poland's Foreign Ministry and others took part in the conference. The selection of participants proved to be very appropriate because it practically recreated the debates that take place on the EU level. More clarity was introduced regarding the Bulgarian position in the negotiations on the financial framework or at least it was explained what interests would be pursued. In a series of articles we will offer you separately the statements at the conference in Sofia, together with video. 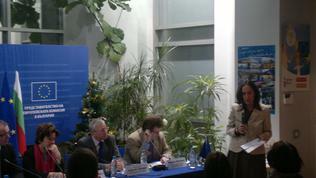 We start with the first part in which introductory remarks made Poland's Ambassador in Sofia H.E. Leszek Hensel and Ms Bisserka Benisheva, Director General of the European Union Department in the Ministry of Foreign Affairs of Bulgaria. euinside: Good morning, good morning to all of you and welcome! I will ask the panelists to start taking their seats. Before I tell you several words, it might be necessary that we shift a little bit the programme as part of the panelists, our Polish guests, would arrive some time later, so we will have to take this into account. Otherwise, everything remains as initially planned. I am glad that the hall is so full for such an important topic, which is yet to heat up in the European Union. Of course, everyone is interested when money is at hand. Naturally, the EU multiannual financial framework (MFF) is always a reason for many serious disputes in the EU. I am very happy that in Sofia too finally such a debate will take place, which is still in a very early stage since the Commission has made its proposal in July how the 7-year budget should look like. Already discussions took place at various levels, including inter-parliamentary debates. You know that the European Parliament's role is very enhanced. My name is Adelina Marini and I am the editor in chief of the web medium euinside for those of you who don't know it. We deal with European issues only. I will be the moderator of the first panel, which you can see in your programme. So, I would like, in order not to waste any more time, first to give the floor to the main culprit for us being here to discuss this topic today and that is His Excellency, Leszek Hensel, ambassador of Poland to Bulgaria. Leszek Hensel: Excellencies, ladies and gentlemen. Only a few months ago I was sitting here and presenting the priorities of the Polish Presidency. The challenging task of starting the debate of the multiannual financial framework (MFF) has resulted in a presidency report on the work progress, concerning the next EU budget and hopefully it will constitute the basis for the December European Council conclusions in this regard. I'd like to welcome all the panelists of today's session and thank the European Commission Representation in Sofia and the Centre for Economic Development for their cooperation in preparation of this event. Let me wish you an inspiring debate, especially that the current discussion about the new MFF is taking place in the moment when the EU is struggling with the debt crisis in the Eurozone which may have potentially disastrous consequences, not only for the shape of European integration but also for the global economy. Certainly the current crisis may influence the negotiations about the new MFF and it has already given us some lessons. And thus we have started looking at the EU budget via possible synergies with national budgets. The truth is that, when deciding on the future budget, together we may save more and guarantee effective expenditure. After this few remarks let me now give the floor to madam Ambassador Benisheva. Thank you for your attention. 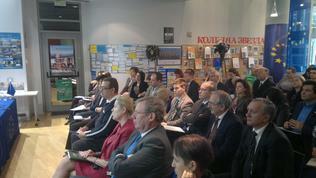 Bisserka Benisheva: Thank you Mr Ambassador, Your Excellencies, colleagues, dear representatives of the academics. For me it is indeed very nice that this conference is being organised today and I would like to express my gratitude to the Polish Presidency, which from the very beginning of the discussion on the next financial framework invested efforts and created such an organisation that allowed the debate to be as broad as possible. Why? Because the next financial framework of the EU for the period 2014-2020 is the future of all of us, the member states, our citizens. Therefore, the broader the participation in the discussion, the better to focus the decisions on the most precise design of EU's budget. The context in which we are starting the preparation of the next budget, as Ambassador Hensel already outlined, is on the one hand overcoming the consequences of the debt crisis, the need the governments to implement measures that restrict spending, national and measures leading toward greater stability. On the other hand, the EU has started another discussion, aimed at endorsing decisions for strengthening the economic union, in the framework of the Economic and Monetary Union. And in this political context, all of us, with the highest sense of responsibility, discuss what should be the revenues and expenditure of the EU for the next 7-year period, so that the budget can fulfil its role of a political instrument directed to the future, that ensures growth and employment in the union. A difficult framework for discussions. In such a moment it is very difficult to bring forward the main principle, laid down in the treaties - the solidarity principle. But we are absolutely convinced that in the end the solidarity principle will prevail in the decisions that we will take on the next financial framework. So far, during the Polish Presidency and in December will end the so called stage of clarification. We are still asking questions what exactly has been envisaged, where what the Commission proposes will lead us and how the final decision will impact all of us. From the beginning of 2012 during the Danish Presidency will start the real stage of negotiations among the member states, so that in the second term, during the Cypriot Presidency we can enter the phase of negotiations between the institutions, aimed at achieving consensus between the Council and the European Parliament. So, the budget for the next 7-year period can be endorsed sufficiently in time by the EU institutions. So far we agree that the next financial framework will be 7 years. 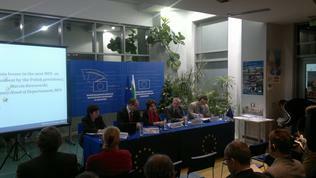 We agree that the next financial framework must contribute to the achievement of the goals of the Europe 2020 strategy. We have almost agreed on what the structure of the next budget must be. Undoubtedly, up to this very moment, we can say that we have a lot of differences among the capitals on what the biggest share should be in the spending part of the budget - be it the traditional policies or the innovative policies. Regarding the reforms undertaken in the Common Agricultural Policy and the Cohesion Policy - are they sufficient in order to bring greater efficiency of the money the EU budget is spending for their funding. The discussions reflect the national specifics of the member states. They reflect their starting positions as an economic level. And what unites us is the political understanding that this budget must be directed toward investments, that this budget differs from the approach to the national budgets, because it is precisely a political tool. And we are all moderately optimistic that the end of our discussions will be successful.